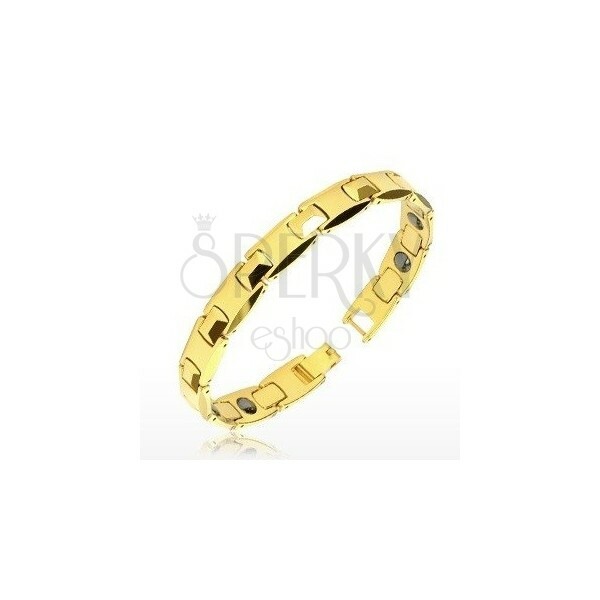 Shiny bracelet made of tungsten in gold colour, lowered edges of links, magnetic balls, wristwatch clasp. By buying this product you can collect up to 29 points as a voucher of 5,80 €. Your reward points. The bracelet made of tungsten links in shape of letter "H" has shiny smooth surface in gold colour with lowered edges. Between the links glistening pyramidal joints are placed. There are magnetic balls in the H-links in the bottom part of the bracelet. Wristwatch clasp.